Father and daughter – a talented double act. 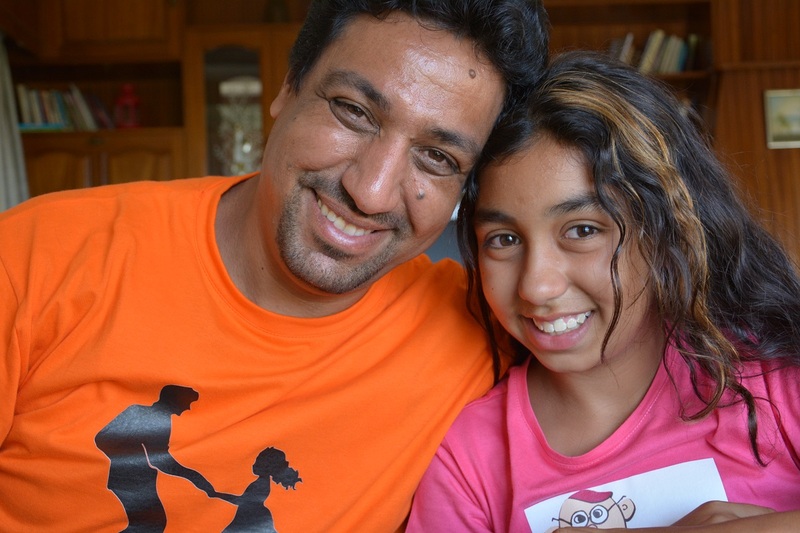 Aya and her producer, director and actor father Hamid are the talents behind the new programme Me and My Daughter, which will be aired on both SAT‑7 KIDS and SAT‑7 ARABIC. The programme uses a range of segments to examine the relationship between a father and daughter, which includes some inevitable conflicts. and my daughter and I are fighting. She’s talking in the Lebanese dialect, I’m talking in the Moroccan, and this sets the theme of the episode. “We even fight about the title of the programme,” he continues. “I’m always saying, ‘Me and My Daughter,’ and she’s saying, ‘No, Me and My Dad’. These different elements are a lot to pack into each episode, and the result is a colourful and entertaining programme. The show’s success is mainly thanks to the talents of Hamid, who apart from starring in it, wrote, directed and filmed it in their Cyprus home using a range of cameras. The programme will be aired across all our Arabis language channels later this year. The show emphasises how a father and daughter can be friends and have fun together, challenging a more traditional dynamic in which a child blindly obeys their parents or even fears them. The programme covers a wide range of topics, from the importance of telling the truth and the need to be physically active, to what happens when we die. One episode focuses on helping children find their individual talents. There’s no doubting one of Aya’s talents – she is a natural entertainer.